Horses are certainly a marvel of creation. They are exceedingly strong and interact with their environment through their senses. Compared to us they see better, hear better, have a better sense of smell, and can feel the smallest insect on their bodies. Evolution has been kind to the horse. Remembering that they are animals of prey, it is understandable why horses shy and spook. They have survived by using their senses to flee from danger for centuries. By understanding this, we, as humans and handlers, can try to think like a horse. By being proactive, we can try to err on the side of caution and safety. We must remain ever vigilant in anticipating a horse's response to its surroundings. Binocular (See the same field out of both eyes) Must be looking straight ahead. Front vision sees 60-70 degrees. Must move head up and down to see. See some color: Have only one cone in the eyes-humans have two. Hearing is extremely important to the survival of the horse. They use their hearing to "detect sounds, to determine the location of the sound, and to provide sensory information that allows the horse to recognize the identity of these sounds...This allows the horse to orient itself toward the sounds to be able to determine what is making the noise." If it is a threat the horse can take flight immediately which ensures the survival of the horse. Remember, the horse is a prey animal. With ears flat back (angry) horses have decreased hearing ability. 16 muscles control the horse's ear; 3 muscles to control the human ear. Range of hearing for a horse is 14 Hz to 25 kHz. Range of hearing for a human is 20 Hz to 20 kHz. Horses can hear slight sound; low volume. Horses are able to detect earthquake vibrations before the human is aware. Horses depend on their sense of smell for survival. They are sensitive to poisonous plants, feces, moldy forage and grain, dirty water, etc. Smell each other, i.e., nose to nose behavior. Vomeronasal organ-The vomeronasal organ, also called Jacobson's organ, is a chemoreceptor organ thought to have to do with the perception of certain scents and pheromones. It is named for its closeness to the vomer and nasal bones, and is particularly developed in horses. The organ is located on the roof of the mouth. I do not know if there is any scientific evidence to support my observation, but I have noticed that horses really do not like the smell of pigs, alpaca, or llamas. They exhibit a flight or fear response when in contact with these animals. I had this happen in Quito, Ecuador, and had to do an emergency dismount, at great speed, when my mount came upon a herd of llamas in a field and my mount went ballistic. I broke three ribs on that caper! Beware! Mature horses like salty tastes, however, many foals do not. They do not like strong tastes such as vinegar. 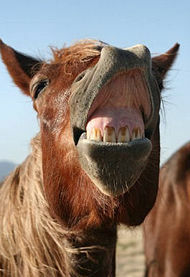 They will exhibit the Flehmen Response as shown above. We use vinegar in the barn to deter the horses from chewing on the wood in and around the stalls. Horses are not nutrition wise when it comes to taste preference. They will not balance their own rations when provided a variety of feeds. Horses will consume feeds at a level far higher than necessary to meet their nutrient needs. Sometimes you can mask the taste of medicine by adding molasses and grain to it. Also, applesauce will often work. Horses do, sometimes get wise to this practice and refuse to eat their medicines or supplements. Respond to pressure--You push--they push back. Horse whiskers act much like the antennae of insects. Horses communicate with each other by using touch. "Mares respond to the touching behavior of their foals in various ways, including milk let-down in response to the nuzzling/suckling stimulus of foals." It might also be helpful to know that horses have an excellent long term memory. They will remember a specific spot where they felt threatened and often shy over and over at that spot. They also remember bad handling. Always remember that every time you handle or ride your horse you are either training positively or negatively. They do not forget. Once they have learned a bad behavior it is most difficult to retrain. It can be done but takes time and patience. Use positive reinforcement when training. Make training a pleasant experience. A stressed horse will not learn. It will just stress. Also, remember how the horse uses his senses to interact with the environment. By doing so you will be able to have a more beneficial relationship with your horse. On the trail my husband and I try to think like the horse. We use all of the information, above, to try to have safe trail rides. Even the most grounded, well trained, sacked out horse will take flight and react to the environment. It is in their DNA! "Research by J. Carroll and others (2001) suggests horses--mules were not studied--have dichromatic vision--they distinguish two main colors--while humans have trichromatic vision--they distinguish three main colors. Many of the colors horses do see are desaturated--or less intense. Colors that contrast with more subtle natural hues attract the animal's attention. Examples include a large white rock against a dark background, a red shirt, or dappled shadows. Many experienced stock stop to make certain such objects are not potential hazards or predators. Similarly, when horses or mules see a surface change, such as shadows or roadway markings painted on asphalt, they hesitate or stop. Reflective materials may confuse stock, especially if the material is used on signs that move in the wind or if lights ripple across reflective backgrounds. Any lighting that distorts natural colors, including some night lighting, affects an animal's comfort, vision, and ability to function well. Horses and mules see very well at night, probably a survival mechanism to escape nocturnal predators. Their large eyes admit substantial light, which is amplified by internal reflectors. The low-light vision of horses and mules is better than that of humans. However, their eyes adjust more slowly to light changes than human eyes. Lighting contrasts when entering or leaving enclosures, such as tunnels or horse trailers, can cause horses and mules to hesitate until their eyes can adjust to conditions. Riding animals have excellent hearing, better than that of humans. Horse and mule ears rotate 180 degrees and generally face the direction the animal is looking. They can focus one eye and ear on the rider and one eye and ear on something else. When they hear something, horses and mules want to see the cause. Noise created by traffic, wind, and other distractions can greatly interfere with hearing, and cause many stock to become skittish. Stock ridden in more developed environments become accustomed to unsettling noises after repeated exposure to them. Vehicles backfiring, sonic booms, gunfire, firecrackers, sirens, helicopters, public address systems, hot air balloons, trains, marching bands, mechanical equipment, echoes, and bridge or tunnel sounds are tolerated by stock that are accustomed to them. Horses and mules that spend time in rural areas get used to noises there, such as the sounds of farm animals or forest activities. However, all these sounds and many others can startle stock unfamiliar with them, making it difficult for riders to maintain control. Horses and mules also have an excellent sense of smell, much better than that of humans. Trail stock may use smell to find their way back. They readily smell other animals, and they can discern differences in the smell of water. Most horses and mules are happy to drink muddy water from a puddle because it has a natural odor, but they may refuse to drink from an unfamiliar source. Many riders travel with a familiar water bucket so their stock will welcome water in the campground. Horses and mules are so sensitive to touch that they can feel a fly land on a single hair. Slight pressure from a rider's legs can guide a horse or mule forward and anything touching its whiskers or body hair can alert the animal to trouble. If an animal brushes up against a narrow passage and feels trapped, its survival instincts kick in. Sharp objects, such as barbed wire, easily cut or damage the relatively tender skin of a horse or mule. Painful or sharp impacts trigger the animal's instinct to run away from the offending object or lunge through it, potentially injuring itself or others. A frightened animal also can damage things nearby. Horses and mules enjoy rubbing against protruding objects because they are handy scratching devices. Given the sensitivity of their skin, stock can easily injure themselves while scratching. Remove or flatten any sharp corners, nails, posts, curbing, or protruding objects that can catch an animal, rider, or equipment. Wire fences should be completely smooth and free from projections or barbs. Some horses--and many mules--are exceptionally bold. Their curiosity leads them to explore anything new in their environment. They smell, push, move, pick up, or play with new objects within their reach. They may pull things into a corral with their teeth or kneel to reach underneath fences for something they want. Depending on the design of the fence or barrier and the size of the animal, horses and mules may be able to reach 6 feet (1.9 meters) beyond its edge. Horses and mules prefer being around others of their kind, where they find comfort and safety. In the wild, horses survived by staying with the herd. This innate herding instinct strongly affects domesticated horses and mules today. If one animal becomes startled, many nearby animals also will become alarmed. When one horse runs, the others want to run as well. The herding instinct can pose problems when new horses or mules are introduced to a group that has an established herd structure--or pecking order. Stock establish the herd structure by kicking and biting... Horses usually dominate mules. The pecking order influences which stock have ready access to food, water, or space in a shared enclosure. Some equestrian facilities address this behavior by blocking views from one animal area to another, but not all riders agree with this approach. Until stock are familiar with each other, they should not be turned loose together in open, common enclosures."